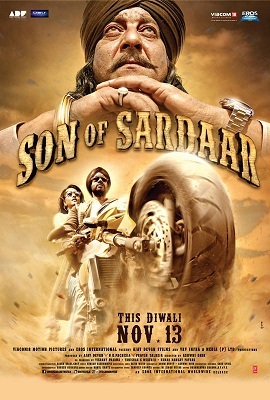 This Diwali it’s double dhaka: Ajay Devgn’s Son of Sardar (SOS) versus Shah Rukh Khan’s Jab Tak Hai Jaan. Now, we are not comparing the two here, that is for you to do, we will simply let you know if it is worth selecting SOS as your Diwali movie choice. Directed by Ashwni Dhir (Atithi Tum Kab Jaoge), produced by Ajay Devgn and with music by Himesh Reshammiya, on the surface SOS is the film of the ‘masses’, whilst Jab Tak Hai Jaan looks to be the film of the ‘classes’. This one is a comedy potboiler, whilst the other is a romantic saga. This one is set in Punjab, whilst the other waltz’s through London. So with the comparison’s over, here is what we thought. The story in a nutshell is Sardar Devgn travels home to Punjab from the UK, to lay claim to his ancestral land. On the train journey there it is love-at-first-sight, with Sukh (Sonakshi Sinha), following which he ends up as a guest in her mad-house only to discover there is an old deadly family feud with his own, which requires his death too. The only safe option is to live-in with the enemy and the only safe haven staying within the four walls of their house, as whilst he is their ‘guest’ they will not touch him, but step outside and his life is on the line. SOS is a remake of a South Indian movie called ‘Maryada Ramanna’. Like the original, the remake also packs in action, drama, humour, songs and dances, which all equal one big masala affair, akin to Devgn’s other films of the same genre. This film falls very much into the ‘leave your brains at home’ genre. On the acting front starting with Ajay Devgn, we have seen play the Sardar before, but this is no Legend of Bhagat Singh. Here Devgn is playful, strong and romantic all in extreme doses and delivers the right tone for the film as a whole. On Sanjay Dutt, so okay, this is no Kancha from Agneepath, nor is it Munna Bhai, but despite that Sanju Baba does exactly what is expected from him – he gets angry and he has a laugh, both convincingly. Sonali is spot on as the village belle and although is still a delight to see, she is close to becoming stereotyped and repetitive. You can easily let her off on this occasion, as she is both funny and sweet, but she does need to watch her film selections. Juhi Chawla is still an absolute delight to watch and is a warm addition to the cast. So the minus, well…with running time of around 2 hours and 20 minutes, short by some standards, SOS could have done with a bit a trimming in some places. On the music side, there are a couple of hummable tracks, mainly the beautiful ‘Bicharan’ and the fun ‘Pow Pow’, but otherwise not exactly a musical blockbuster. Directorially Atithi Tum Kab Jaoge by Ashwni Dhir was a far more superior and sophisticated product, which had some great comedy, SOS is not necessarily a step back, but definitely a step in another direction, as far as film making is concerned. In the UK we call it marmite (a food substance), you will love it, or you will hate it! Perhaps a more apt desi description is sweet or salted lassi. You either prefer sweet lassi, or you prefer salted lassi, or maybe even both. Hell, why not have a cocktail of sweet and salty! In any case that is the verdict with SOS. If you loved Wanted and Dabaang, or even Devgn’s own Golmaal series and his recent Bol Bachchan then SOS is definitely for you. 17 queries in 0.563 seconds.